I started racing Slotstox at the inaugural meeting of the Foxhall Foxes Supporters Club on 11th May 1984 racing a Chris Berry built replica of the Superstox raced by 546 John Gray. The youngest of all the twelve drivers racing at this first meeting, I was 6th highest points scorer. 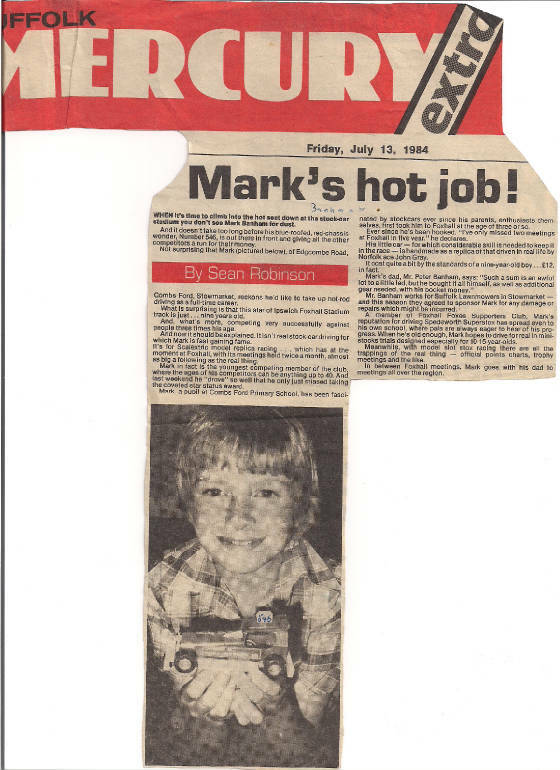 My racing was sponsored by Suffolk Lawn Mowers and I was featured on the front page of the Suffolk Mercury on Friday, July 13th 1984. Courtesy of Foxhall Foxes Supporters Club organiser Kevin Wegg, news of this article was reported within the Slotstox Report column in the September 1984 Spedeworth Wheelspin magazine. With some consistent performances: by the time of the inaugural Slotstox Foxhall Championship on 5th and 26th October, I was Yellow grade status. At the Slotstox Foxhall Championship, I qualified for the quarter-finals as joint 2nd highest points scorer in the heats with 36 points. By qualifying for the quarter-finals, I won a Foxhall Foxes pin badge. With the track at the Foxhall Foxes Supporters Club only having a one inch high fence, my Slotstox was soon looking less than pristine after some inexperience and youthful exuberance saw several crashes on to the floor! I ended the season by winning a Championship at the Foxhall Foxes Supporters Club's end of season gala night - the inaugural Foxhall Grand Parade Championship. I continued racing at the Foxhall Foxes Slotstox Club. By the time of the Foxhall Foxes Supporters / Slotstox Club’s first birthday meeting on 10th May, I was Blue grade status. By the time of the Slotstox Foxhall Championship on 14th and 21st June, I was racing a Slotstox built by Julian Beaumont. I did not qualify for the quarter-finals. By maintaining Blue grade status, I qualified for the inaugural Slotstox English Championship on 1st December hosted by the Foxhall Foxes Slotstox Club. With many drivers racing, including visitors, Foxhall Foxes Slotstox Club qualification was restricted to drivers of Blue grade status and above. At the Foxhall Foxes Slotstox Club's end of season gala night I defended the Foxhall Grand Parade Championship. Now racing a Derek Taylor built Slotstox, I qualified for the semi-finals at my first away meeting: the Slotstox East Anglian Championship at the Wisbech Fen Tigers Slotstox Club. I was eliminated in the semi-finals, finished 4th in the B-final (10th overall) and won a medal. My Slotstox looked a little bizarre as the side irons had been cut off so as not exceed the maximum weight limit! 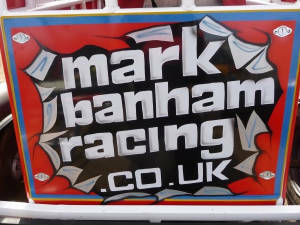 At the Slotstox Foxhall Championship on 13th and 27th I did not qualify for the quarter-finals. I won my third trophy for 3rd place in the final at round 8 of the Slotstox Foxhall Grand Prix Series Championship on 21st March. At the Slotstox Foxhall Championship, I qualified for the quarter-finals. By qualifying for the quarter-finals, I won a Foxhall Foxes key ring. I started racing a Slotstox built by Chris Butcher Racing and I was fluctuating between Yellow grade status and Blue grade status. I was Yellow grade status at the time of the Slotstox Foxhall Novice Championship - open to White and Yellow grade status drivers only - and won my first Slotstox Championship. I won another trophy by qualifying for the final of the Slotstox Foxhall Masters B-final Championship. At the Foxhall Foxes Slotstox Club's end of season gala night (which I missed due to feeling unwell), I won the Foxhall Grand Parade Championship for a third time following 1984 and 1985. I won with a cardboard frog ('frog' being the nickname of the style of Slotstox I was racing) that sat on my Slotstox and drove out of a box wrapped to look like a present with an opening at the front!